Published Sep 04, 2006 - 18:52:27 CDT. WESTERN YOLO COUNTY - John Stotts' work day begins before he gets there. At 4 a.m., about an hour before he arrives at work, the gates on the Capay Diversion Dam on Cache Creek move, opening or closing the dam a little so it allows the right amount of water to flow through for that day. "It has to open before I get (to work)," the 28-year-old ditchtender said during a recent drive along his route for the Yolo County Flood Control and Water Conservation District. In addition to kicking off Stotts' work day, the dam is a vital structure in Yolo County agriculture. 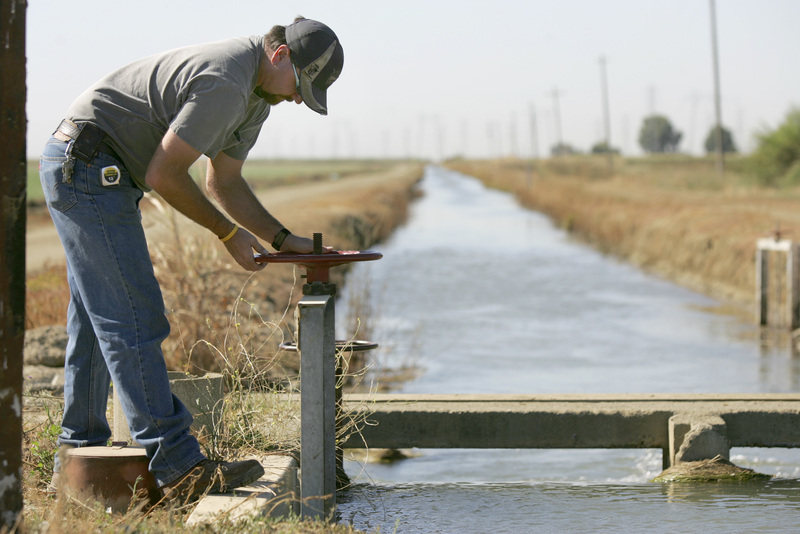 The water district is modest about it, but the truth is Yolo County has the dam to thank for much of its agricultural success. If it weren't for the dams, bodies of water and the district's 162 miles of canals diverting surface water to Yolo County farms, the farms would have trouble growing many of the crops they produce today, district General Manager Tim O'Halloran humbly admitted. When not irrigating farms, such as during the rainy winters, district employees work on the system and equipment and keep the canals from clogging with debris. They make sure water isn't flowing into the canals from fields or roads, adding to what they are designed to hold. O'Halloran views the district as a water resource agency, not just a water purveyor. As such, his office also is involved in planning and environmental activities. The district recently partnered with the California Conservation Fund to purchase 320 acres in the Dunnigan Hills. The organizations hope to create a reservoir and habitat area on the land. The district generates hydropower for the California grid, O'Halloran said. It has a contract with Pacific Gas & Electric Co. and a hydroelectric facility at the Indian Valley Reservoir. Still, its primary function is to irrigate farms - or, as O'Halloran says, to serve farmers. "We're not here to run water," he said. "We're here to serve the water users. And if we need to make improvements to our system or to our methodology, we need to adapt ... to the farming changes, and not vice versa." He is pursuing more monitoring, more controls, more efficiency in the system. The district needs to be proactive, he said, in meeting the needs of changing agricultural practices. Indian Valley Reservoir and Clear Lake are the two major water sources for the district's system. Yolo County farms - most, if not all, of which are family-run - grow tomatoes, alfalfa, rice, peaches, nuts, grasses, corn and sunflowers. Each day, farmers call the district office, on Highway 16 in Woodland, to order water for the following day. Each morning, equipped with a clipboard and laptop, Stotts and other ditchtenders log scores of miles in their pickups, opening the gates along the canals to allow specified amounts of water into the farmers' irrigation systems. The routine is a tedious balancing act. Their job essentially is to try their best to manage forces of nature. They adjust and tweak the system as the water flows through, keeping track of measurements and adjusting gates and gauges. "It really is an art," O'Halloran said, "an art of moving water." It is on one of those days, a Tuesday in August, that Stotts is rumbling through his route in a rattling pickup - a spare from the district, since the transmission in his usual truck went out the day before. "We go through brakes and tires like you wouldn't believe," he says. "It's different. It changes every day." He began working for the district seven years ago and was hired on full time five years ago. Before that, he worked for the Esparto Community Services District in the town his family has lived in or near for seven generations. His T-shirt - part of a casual work attire that includes a fraying Kings hat - bears the name of the Esparto Fire Department, where he has volunteered for more than a decade. The laptop rattles on a metal stand to the right of the truck's radio, playing country music. "Thing goes off all day long," he says. Sometimes it's the district office calling, sometimes farmers who want to talk directly with him about their water needs. "This is my office," he says of the truck. He drives 120 miles per day, exiting the truck only to measure water levels, set gauges and tend to the gates on the canals. An automatic gate has broken, another employee tells him. He drives to the site and slides a wooden board into the structure; he will have to regulate the rushing water manually for now. His job offers a tour of all the scenery western Yolo County has to offer: Horses, pastures, farmland that is home to a variety of crops, hills in the distance, birds, butterflies. Yesterday, he drove within a few feet of a beaver before it realized he was there and escaped into the canal. This morning, he saw a coyote eating tomatoes. At one gate, he lowers a measuring tape into a concrete pipe, called a stiling well. He is tracking the pressure on the two sides of the gate, the water flowing through and the amount the gate is open. He runs a calculation on the laptop to determine the amount of water going through the site, then moves on. He has to be at the dam by 11 a.m. to set the dials for the next day. If he doesn't get it set in time, the dam could send too much water down the next morning. At the office, the phones are ringing, ringing. Farmers know they must finalize their water orders by 11 a.m., so the final half-hour usually is a busy time for Bonnie Zentner and Christina Cobey, who spend mornings juggling the phone and their other work. June and July are the district's busiest months for farm irrigation, Zentner says. The heat wave was a problem for some crops, such as tomatoes, this year, but the district is not having to limit the amounts of water they can send to farmers like it had to do every year from 1991 through 1994. Zentner hadn't begun working for the district during the drought in 1990, but that was the year there was no water at all. At the dam, it's 11 a.m. and Stotts has talked with the other ditchtenders about the water their routes will need tomorrow. "So, this is where I got to start thinking now," he says, quietly doing some math before heading to the dam's control building to set the dials. Tomorrow, at 4 a.m., the dam's gates will move and the routine will begin again. - Reach Beth Curda at bcurda@davisenterprise.net or 747-8045.